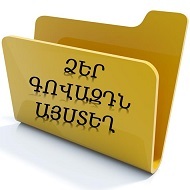 Ներբեռնել լավ որակով ( PDF) ՓՈԽԱԴՐՈՒՄ և ԱՊԱՀՈՎԱԳՐՈՒԹՅՈԻՆ: SUPPLEMENT. ԹԱՏՐՈՆ, ԿԻՆՈ, ԵՐԱԺՇՏՈՒԹՅՈՒՆ: THEATRE, CINEMA, CONCERT: (էջ 178-181). ունի: Where would you like to go? How about going to the theatre? What’s on at the theatre today? են: Did you get your tickets in advance? Have you any extra tickets? Նրա խաղը զուրկ է զգացմունքից Let’s go into the foyer. He is at his best today. կողմից: Who’s playing the main character? Ֆիլմը հոյակապ է նկարահանված: Where is the film on? It’s a real work of art. It’s a masterpiece of the cinema. I’m very fond of music. I play a bit sometimes. ջազային երաժշտության It was a concert of chamber music.